English monthly magazine Shindig! issue #90 is all about French Pop. The issue, entitled “L’édition spéciale” is now available in-store and to order online. Launched in 1992, Shindig! seeks to “end mediocrity in music magazine” and offers to “bring the scope and knowledge of old fanzines and specialist rock titles to a larger readership”. The magazines connects the dots between “music from the past” and current productions. It sheds light on garage, psychedelic, progressive rock or synth pop acts. 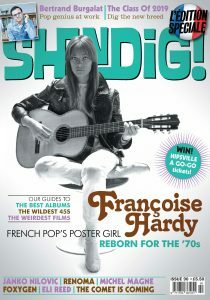 The issue #90 focuses on French Pop: from French icon Françoise Hardy to the Class of 2019 and “Pop genius” Bertrand Burgalat. The Magnificient Eight – French acts and labels to watch! A seven-page feature highlights the French labels & acts to watch in 2019. Among the labels are cited: Born Bad, Entreprise, Cracki, Pan European Recording, Record Makers or Because. As for the artists, the magazine recommands Melody’s Echo Chamber, L’Impératrice, Feu! Chatterton, Juniore, Laure Briard, Bess of Bedlam, Le SuperHomard and Dead Horse One. Listen to the Class of 2019 in our Pop the Champagne playlist. Journalist Thomas Patterson met with Bertrand Burgalat, producer and founder of label Tricatel. The featured interview comes back on his experience and what makes him an “accidental sssuperstar”.